I am a big advocate for helping at the school in whatever capacity you are capable of. Some parents can help multiple times a week while others can do a couple of times a month. When I just had one in school, I went in every week to that class. I still go every week, but with two in school, I did a different child’s class each week. I am not sure how I will work out helping with three in the school. I think I will still try to do each child twice a month…anyway, that isn’t the point. This is my number one favorite reason for helping in the class. I try to not take up the teacher’s time, but throughout the year, there are many times I am able to talk to the teacher. Teachers give so much more information about your child during an informal conversation while you are there helping than they give in the 15 minute parent teacher conference you go to 2-3 times a year. You will be able to talk academics, behavior, quirks, funny stories, social skills…these conversations are so helpful to me as a mom to help me to know how to best help my children at home to have success at school. If you can’t talk while helping, you will at least feel more comfortable talking to the teacher before or after school, and let’s be honest, a teacher is going to just naturally have more inclination to be helpful to someone who is always there helping them. I wouldn’t say they do it intentionally, but human nature is that we want to help people who help us. I love getting to know the children who are in school with my child all day every day. I then know who my children are talking about. I know what type of kids my children are drawn to. I have also at times discerned social stresses that I wouldn’t have otherwise known about. For example, toward the end of the year last year, Kaitlyn was feeling very stressed because an old friend was upset that she had made new friends and Kaitlyn didn’t know how to navigate the feelings of her old friend. I picked up on this just by seeing Kaitlyn’s face clear across the room as she talked to her old friend. I later asked her about it and she spilled her worries and concerns and we were able to talk out strategies for her. Initially, your child is very aware of your presence and tries to show off for you. Before long, however, you kind of blend in to the scenery as you are there and your child acts like herself and you get to see how your child is at school. This can lead to a myriad of emotions, from pride to dismay. I find this valuable because quite frankly in this modern day, many teachers are hesitant to tell parents when their child is anything but perfect. You can tell a teacher to let you know about anything that needs to be worked on, but until the teacher knows you, she will be hesitant to tell you the bad news unless it is a big problem. I am interested in helping my children’s character grow, so as I observe my children at school, I can commend them for their strengths and help them figure out ways to improve on the weaknesses. My children LOVE to see me helping in the class. The other children are always excited to see a mom in there helping, too. It just makes them all happy. I am sure they are happy to see their mom, but also happy to know that their mom cares enough to be there to help out. Other children can feel good knowing that a lot of different people are pulling for them. You are a positive influence in the classroom. You helping in the class helps your child’s education be enhanced. You might help run centers or reading groups. You might help struggling children during a math lesson so they don’t fall behind. You might simply do some clerical work for the teacher, freeing her to be more present for the students. You helping makes it better for your child. If your child doesn’t struggle, it still benefits your child if the struggling children are helped because then the class can move ahead faster. You also will be more aware of the expectations of your child’s teacher. I know when I help with some teachers, I help correct papers or help students during lessons and I then know how the teacher is teaching a concept and can build on that foundation. 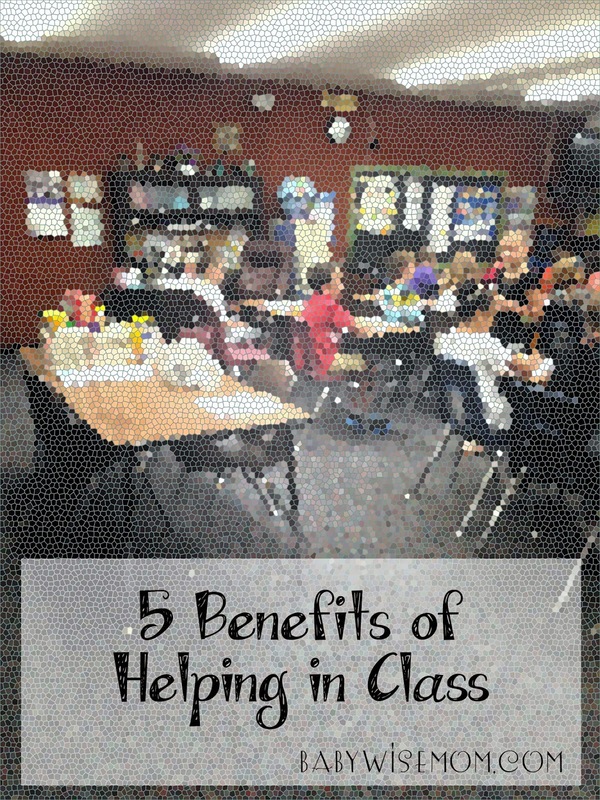 Helping in your child’s class can defintely be inconvenient at times, but I can promise you that I have found nothing but benefits all around by helping in class. I have helped for the past 4 years and plan to continue doing so. Next Post Teachers, To Request or Not Request? I am just wondering how you help in the class with little ones at home to take care of. Do you leave the toddler/baby with family so you can help? We are adding our third soon, and starting to wonder how all this works out. Thanks! I pretty much always leave my other kids with my mom. A great thing to do if you don't have family is to switch babysitting with a mom with a child in that class. So you watch her kids while she goes one day and she watches yours while you go another day. Ditto Watt' comment! Wondering how to make it work..
Love this post! I'm definitely hoping to volunteer a good bit in my daughter's class this year.